It has been 69 years since the United States of America gave the Moro nations — its people and territory — to the Indios to create a new nation-state called The Republic of the Philippines. (Aguinaldo’s Republic did not include the participation of the Moros and was not recognized by any country while the Japanese-sponsored Philippine Republic was recognized only by Japan.) America had no basis to do so. The Moros were never conquered by the Indios. Perhaps America can rectify its wrongful deed. England gave back Hong to China after a century and a half of colonization while Portugal gave Macao back to China after ruling it for around 400 years. 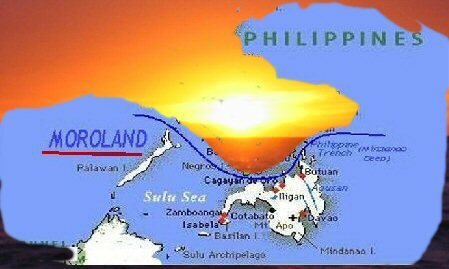 America can give back to the Moros the freedoms and territories they had lost (including Sabah) when America gave the Moro nations and Moroland to the Indios and their newly minted nation-state. With the new century / millennium starting with an American War Against Terrorism, which many Muslims the world over see as the War against Islam, the prospect of a renewed Moro War is quite bright. (The lapsus linguaeof US President Bush when he declared a “Crusade” against his enemies did not escape the Muslims’ attention). We call on America not to be blinded again by the sweet words and promises of the Indios — like a new military base. We call on America to not to add another injustice to the Moro people. We call on America to right the wrong it had done to the Moro people. Our fathers and forefathers had asked America for protection against the Indios-Filipinos. Instead, America fed them to the lions, as it were.